Gabby Douglas Wins All Around Gold – Already on a cereal box! The marketing of America’s newest gymnastics sweetheart has begun. 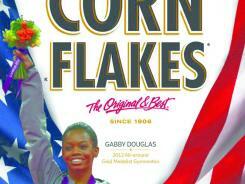 Gabby Douglas, Olympic gymnastics all-around champion, will be featured on Kellogg’s Corn Flakes. Things are moving fast for the 16-year-old who, fittingly, trains in Des Moines, Iowa, the heart of corn country. Also Friday, she appeared on NBC’s Today show, first by herself and then along with the three other American women to win the coveted all-around title: Mary Lou Retton, Carly Patterson and Nastia Liukin. They are not wasting any time! It is very exciting what this young lady has accomplished but I think she has no idea what she has not gotten herself into. She will forever be under the spotlight. Constantly being chased by cameras. It is only a matter of time before the scum out there start to dig into her personal life to uncover some “dirt” that the general public MUST know. It is kind of bitter-sweet. I am so proud of her and I feel sorry for her at the same time. US gymnast Gabrielle Douglas performs on the beam during the artistic gymnastics women’s individual all-around final at the 02 North Greenwich Arena in London on August 2, 2012 during the London 2012 Olympic Games. Douglas won the event. The proud mom to the gold medal-winning Olympian opens up to Us about her daughter’s road to London. Previous articleTrue happiness comes from within yourself, not from someone else. Stop searching, start living.